Helpful hints: since iron ore information should be accurate for its dressing flow, our engineers need to know well about your raw materials before designing the iron ore dressing plant. Iron ore dressing plant usually involves a combination of crushing and milling as well as magnetic separation. This is achieved by passing the finely crushed ore over ball mills and magnetic separators. The common iron ore crushers are jaw crusher (for primary crushing), cone crusher or fine jaw crusher (for secondary crushing). Materials in large lumps are reduced by crushers into small particles and then separated by vibrating screen. Large ones return to crushing process, while small ones pass to milling step. Low intensity magnetic separator is used to realize rough separation. Very low Fe content iron ore (-17%) is discharged as tailings, while high Fe content iron ore (+52%) is passed to thickener then to double spiral classifier. Large ore particles pass to secondary ball mill to be grinded into products less than 200 mesh in size which will return to secondary thickener. The others pass to cylinder screen. Iron ore with 53% of Fe pass to cleaner separation. High intensity magnetic separator plays the role of cleaner separation. Product of 62.07% Fe content is regarded as iron ore concentrate, and the rest product is moved to thickener and then to cylinder screen. Low Fe content material is discharged as slag. 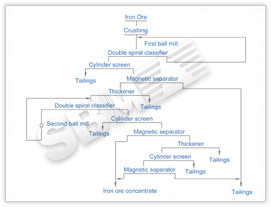 Iron ore of high Fe content (+39.11%) is moved to scavenger magnetic separator to maximize production yield.